In the mood for some good tasting beef ribs? 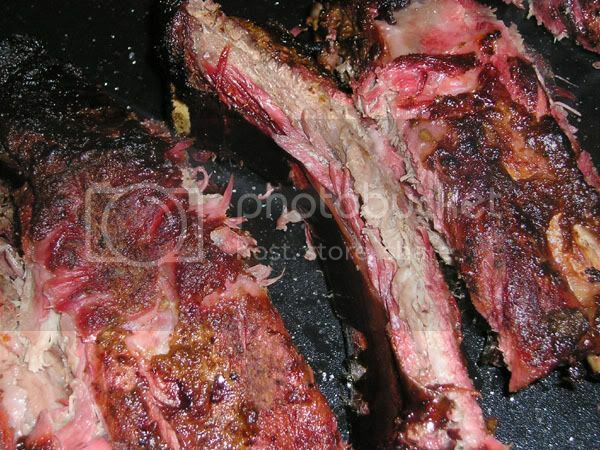 Some people call these dinosaur ribs because of the size of the slabs. Myself, I enjoy making them but beef ribs from a large grocery store can sometimes be disappointing. 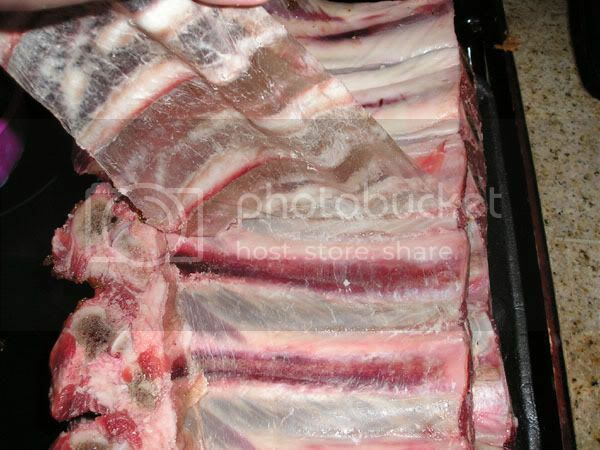 Large retailers often sell ribs that are cut so close to the bone that you are buying mostly bone. My suggestion is to buy your ribs from a butcher or store that trims their own meat. That way you have some input as to how closely you want your ribs cut. This recipe really plays on the beefiness of the rib. The beef base we will be using is a paste. You could use cubes, but I prefer the richness that the paste gives to the rub. We will also be applying our rub a bit differently this time around. This is because I am anticipating spritzing the ribs as they cook (which will dilute the rub) and the rub paste allows for a more moist outer covering. Finally I will be adding a mustard slather. The slather will cut the rub paste just a little and make a unique crust form on the ribs. 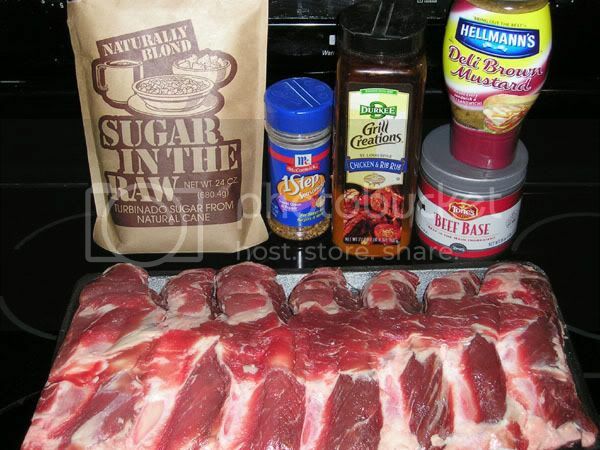 The flavor of the mustard will disappear when you smoke meat so don�t worry about having mustard flavored ribs. 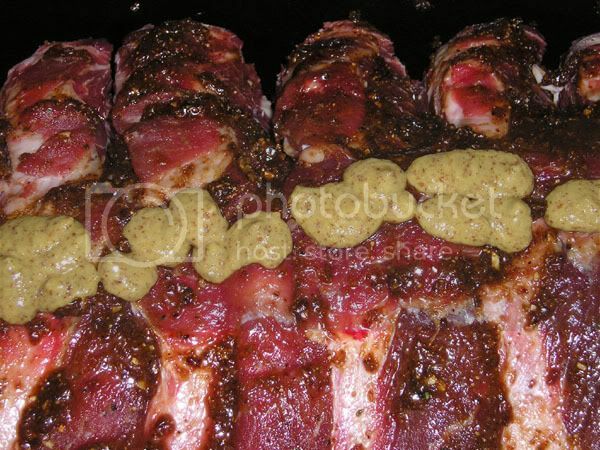 Mustard in BBQ is used to hold spices and flavoring on the meat. 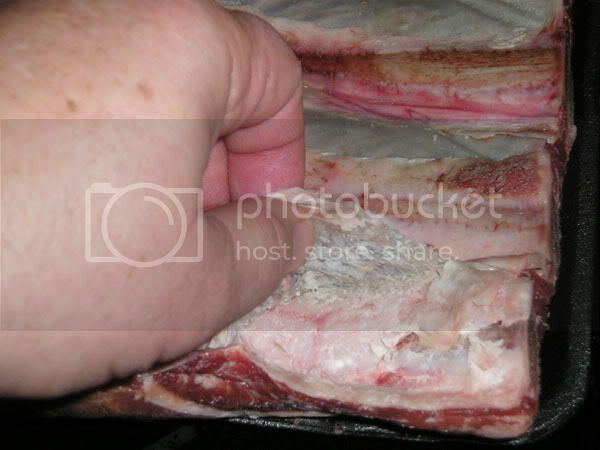 We start by removing the membrane off the back of the ribs. I normally use a butter knife to raise the membrane and slowly pull the membrane from the ribs. Mix the entire contents in a bowl till a past consistency is formed. 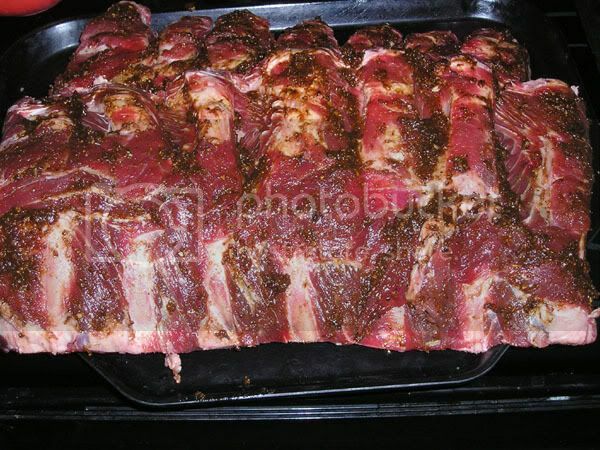 Apply the rub past masking sure that you have rub in all crevices on top and on the sides of the ribs. 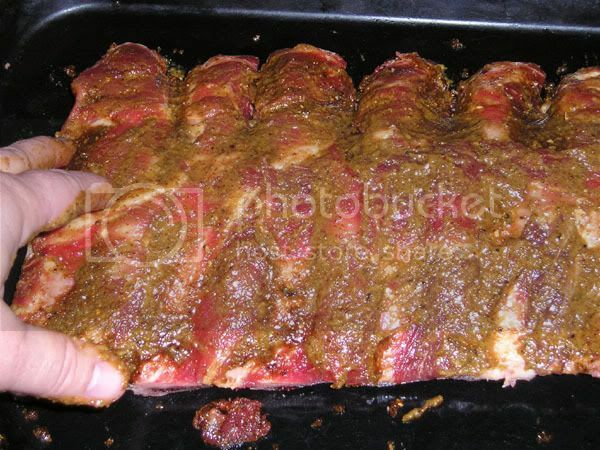 There is no need to apply rub to the bottom of the ribs. After you have the rub applied. Squirt on a generous portion of the brown mustard to the top of the ribs. Rub the slather on the ribs making sure that all portions of the top are covered. 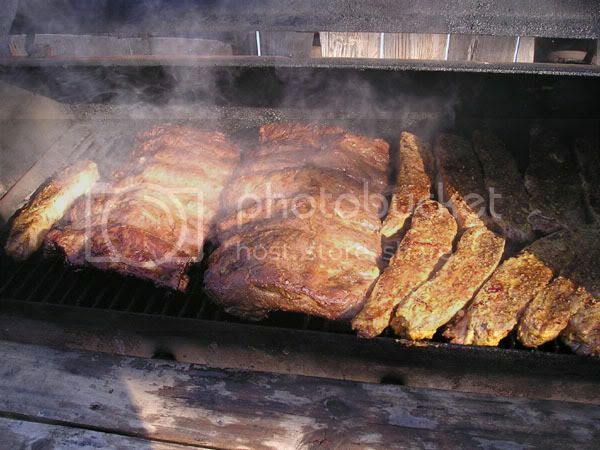 Place the ribs in a preheated smoker at 250 degrees. These are large ribs so I am using my Alien Bolo to move them to the cooking chamber. You want to place the ribs in the smoker in such a position that allows the thicker side to be closer to the hotter side of the smoker. As you can see, two racks of ribs almost take up the entire grate on one side of the SnP. Spritiz the ribs with a 3-3-3 mixture of Extra Virgin Olive Oil / Apple Cider / Rum or Jack Daniels every 30 minutes to an hour. Once the ribs are done (in about 4-5 hours at 250 degrees) they will be the consistency of your palm pad (on your hand.) You could try and take their temp, but the meat is so close to the bone, you will get different reading every time. I normally just start looking at them (tasting) after the four hour mark and then determine if they need longer to cook. Today is a treat for me. I am trying out my new �Rib Buster�. This BBQ tool is designed to split the joint bone in ribs by applying pressure on its sharpened edge. I would normally use a knife, but this tool allows you to use two hands on the tool to control placement of the sharpened edge. 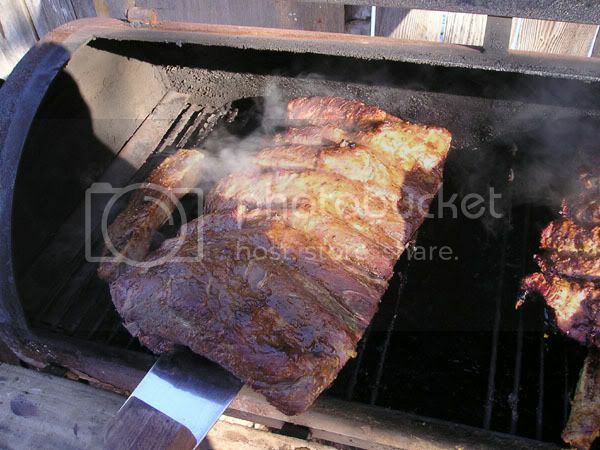 All I have to do is put a little pressure on the handle and the ribs literally �PoP� as they split in half. 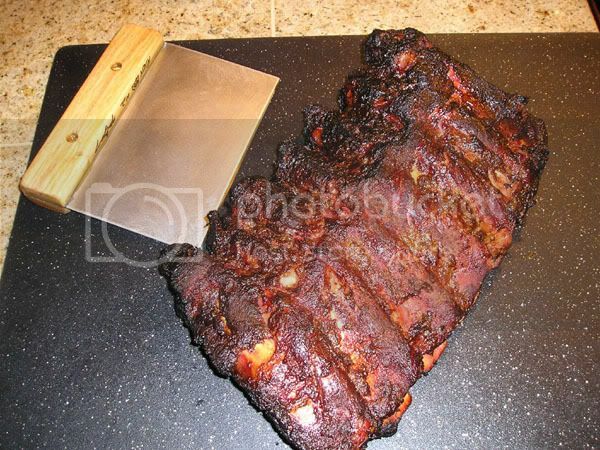 As you can see, these ribs are not �wet� ribs dripping with BBQ sauce. However, they are moist, have a good smoke ring and a decent crust from the rub paste and mustard slather. Sure looks good from here Alien. Making me hungry and it's too late to start the cooker. My wife LOVES beef ribs, and I being the worthless pork loving husband I am, have not made them for her in a good long while. Looks like I have some cooking to do this weekend. How do I get the Rib Buster? Thanks for the post Alien! I like hte idea of using base as a paste. Sounds good! What did you think about it, how did it compare to normal? I liked it a lot. I put my sauce on the side, but really didn�t use it because the past rub was good by itself. BTW did your �Rib Buster� arrive? Also I will be in Overland park in April. Not yet, probably gonna get here today! Can't wait to try it out. Give me a shout sometime in April when you're up here if you have the time. We can go grab some good Q. Cool, I should be here that weekend as far as I can tell. Got the package last night. Sweet tools. The wife asked why I ordered a machete, she just doesn't get it. I mean, it doesn't even look like a machete I explained, she was convinced it is a machete. The Rib Buster looks like it is ready for some serious chopping action! Looks like ribs will be on the menu this weekend! If any one is interested in the rib buster you might find it called by another name. I used one for 16 years at Dominos pizza we called it a dough scraper. You should be able to get one at any restaurant supply house. I agree, I got the idea from a french pastry cutter and you can buy one of those at any restaruant supply housefor about $13. The only difference is that this is not a thin flexable blade. It is made from the same thick stainless steel I use for the Alien Bolos, it also has a double sided ground edge. Yeah, I'm familiar with dough scrapers. While this may look like a dough scraper in general shape and size, this is far sturdier and better suited for chopping tough meat than a dough scraper. You really need to feel the weight of one of these and feel the edge to appreciate the difference. Alien, To get a butcher to leave extra meat on this cut, is like looking up a dead horses tookas. Figure the cost, and follow the money. What do ribs sell for? What does rib eye sell for? Anything left on the ribs, is sold for the lower cost. It's just that simple. There might be an opportunity to buy meatier ribs from the plate of the animal, and these would be the correct place for extra meat for all concerned, but, because of boxed beef, and pre-cut primal cuts of beef, this option will be exrememly hard to come by. As an aside, if you are traveling to Wisconsin, please give me a heads up. I don't know if I can put you up, but with a little warning, I know I can feed you and yours. Great looking food very nice presentation. I know,����.. there is an actual name for the meatier cut of ribs but the name is evading me right now. Our butcher guys get a little sloppy sometimes and leaves extra meat on the bone, when I see them, I grab them. Thanks for the invite, this summer I am doing some work for Texas A&M, I don't know where they will be sending me, (no schedule yet) but for what they are willing to pay, I really don't care. My butcher explained the extra 1/2 - 1 inch of meat is called the cap. 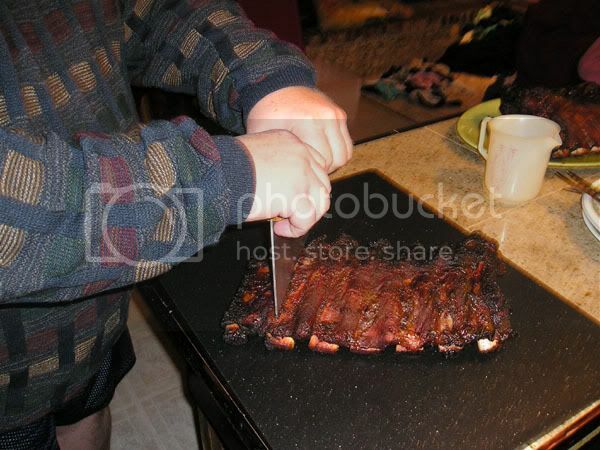 Hence he calls them ribs with the cap on. I don't know if that is technically correct or not but it works at my butcher. Those look awesome. Thanks for the how to. My local grocer had some beef ribs on sale real cheap so I bought some but never made them before. Is the name you are looking for short ribs? I know that's what they call them at my local grocer, which is an Albertsons. They are sold cut into individual ribs approx 3-4" in length, but the butcher receives them as a rack with 4-5 bones of 10-12" in length. They have a ton of meat on them and at least here, the butcher will sell them to you that way if you catch him before he's trimmed them all. Good stuff for sure! Regular beef ribs are from the back to the middle of the steer and can be like 16-17 inches long, but most are cut down to like 6-7". Part of these are what you see on the back of a standing rib roast or prime rib. Thats why they are hard to find meaty because they try and cut as much meat from the bones as possible to get more ribeye steak prices. Short ribs are from the lower plate area. These take a long time to cook even if you braise them. But, goooood eats for sure when done right.